I strongly agree with his answer, and one of the ways that Spanish continues to be enjoyable to me is listening to mariachi songs. Many a traveler to Mexico has experienced being encircled by these elegantly dressed musicians, enjoying their peppy rhythms while hearing the classic Mexican cry-shout during a song. The origin of "el mariachi is uniquely Mexican. However, many other countries thoroughly embrace it. Troupes of these musicians along with dancers give well received performances in Europe as well as Asia. The ensemble is usually dressed in the Mexican rodeo style clothing known as “charro”. The pants have metal buttons down the sides, and women have skirts with the same adornments. Often they wear large fancy sombreros and wide bow ties. The instruments used most often include violins, trumpets and guitars of various sizes. The huge guitar that serves as the bass, is known as a guitarrón. These artist are known to sing and play a variety of styles of music such as ranchera, the jarabe tapatio aka The Mexican Hat Dance, ballads and polkas. These lively bands are hired for every type of fiesta. You can hear them at birthdays, graduations, weddings, farewells and funerals. Romantics use them to serenade a loved one. 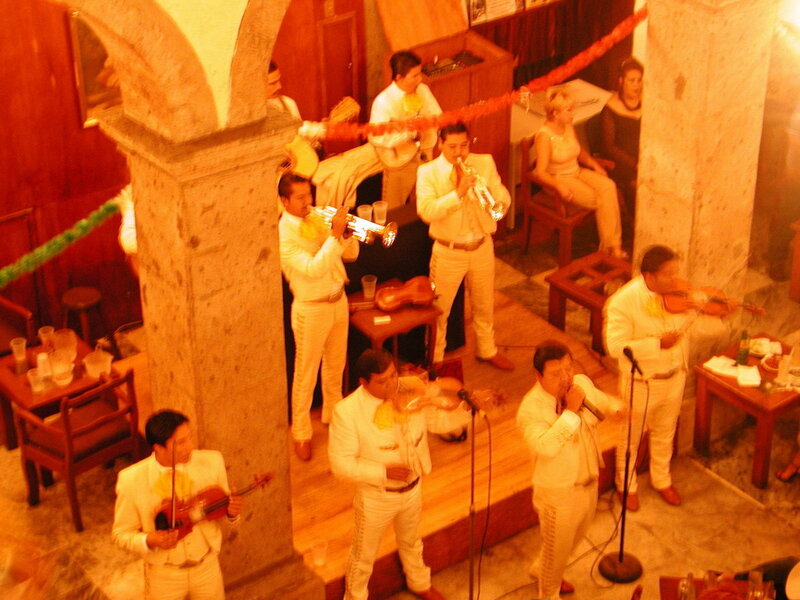 Though a boyfriend can hire a mariachi to sing to his “novia”, it is also common for a son to get one to sing for his mother on her birthday or Mother’s Day. Depressed romantics love listening to the sentimental songs that go so well while downing tequila. These songs can cover being jilted, pining for a girl or Mexico, and being truly macho. Listening to mariachi songs can be a very pleasurable way to improve your Spanish and partake in the traditions of another culture. What I like most about mariachi songs is how they are a reflection of a passionate people. The songs stir up raw emotions and memories. The violins can tug at your heartstrings, the trumpets can be happy and wailing in the same song. Singing along with the musicians doubles the drama and pulls out the stops on feelings that can crescendo to a loud Mexican grito! or cause some to end up crying in their beer. Mariachis are a cultural treasure to be experienced! (Famous mariachi songs include:La Son de la Negra, Guadalajara, La Bamba, El Jarabe Tapatio, Volver volver, El Rey, Las Golondrinas (used in farewells).